The recession is continuing to have a big impact on the way people shop and travel in the UK. April was another strong month for baked beans, which are classic recession food: they are cheap, tasty and they do not go off in the cupboard. This series looks at the developing recession through indicators that are not usually considered. What are you giving up in the downturn? In April, the value of sales of baked beans rose 21.6% compared with the same month of 2008, which was its sixth consecutive month of growth around 20%, according to figures prepared for the BBC by the market researchers Nielsen. Olive oil sales were barely changed last month with a 0.2% fall - they have been relatively resilient in the past six months, having shown a gain of 6.0% in March. The robust sales of olive oil had been attributed to more people cooking at home and still being prepared to pay for quality ingredients. A miserable year for organic sales continued in April with a 10.6% fall in sales that followed March's huge drop of 21.6%. As expected, supermarket budget lines continued their strong performance, showing a 22.9% rise in own-brand sales. Finally, sparkling wine sales were up 9.9%, but that is in contrast to sales of Champagne, which were down 9.0%, as people substituted one for the other. Beans and budget lines were not the only growth areas for retailers. In the first three months of 2009, 2,462,700 flat-screen televisions were sold in the UK, up an impressive 17.5% on the same period of 2008, according to figures from GfK Retail and Technology. Despite the big increase in unit sales, the amount of money paid by customers for flat-screen televisions actually fell 1% to £980m. "Prices have declined, particularly in the most important category, 32" LCD, from £502 in April 2008 to £391 in April 2009," says Nick Simon from GfK. "But sluggish value performance can also be attributed to the popularity of 19" and 22" TVs as we gradually switch over from analogue to digital broadcasting and people replace smaller second and third TVs or acquire them for the first time." 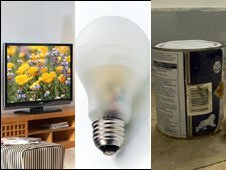 There was the same picture in low-energy light bulbs, with unit sales growing 38.8% but sales by value falling 3% as the average price for a bulb fell from £1.25 to 87p. Sales of emulsion paint, which are considered a bellwether for the state of the DIY market, fell 7.4% in the first three months of the year, to 37.4 million litres, with very little change in average prices. DIY activities are closely linked to the state of the housing market, as people spend more on their new homes or getting them ready for sale. In the transport sector, the airport operator BAA continued to see traffic falling. The company that operates Heathrow, Gatwick, Stansted, Glasgow, Edinburgh, Aberdeen and Southampton airports saw passenger numbers fall 2.3% in April compared with the same month in 2008. Even that fall was boosted by the late occurrence of Easter. In the first four months of 2009, traffic fell by 8.0% compared with the same period last year. On the railways, the total number of passenger kilometres in the first three months of 2009 came in at 12.5 billion, which was up 1.0% on the same period last year, the Office of Rail Regulation says. 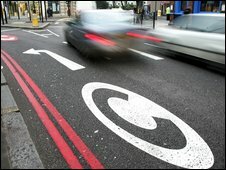 On the roads, London's congestion charge was paid just under 9.5 million times in the first four months of the year, which was down 9.8% on the same period last year, according to Transport for London. And the number of vehicles paying to cross the Severn Bridge in the three months to the end of February was down 3.1%, according to Severn River Crossing. So, many of the trends reported earlier in the year have continued or grown, with airlines cutting back on flights, the railways still showing moderate growth and toll road use falling. It appears that many of us are already adjusting our spending patterns for the harder times.